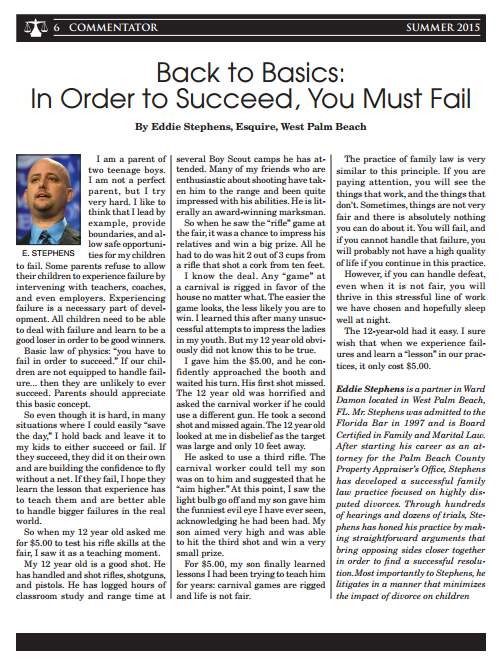 Originally published in the Family Law Section Commentator (Summer, 2015). I am a parent of two teenage boys. I am not a perfect parent, but I try very hard. I like to think I lead by example, provide boundaries and allow safe opportunities for my children to fail. Some parents refuse to allow their children to experience failure by intervening with teachers, coaches and even employers. Experiencing failure is a necessary part of development. All children need to be able to deal with failure and learn to be a good loser in order to be good winners. Basic laws of physics; “you have to fail in order to succeed”. If our children are not equipped to handle failure… then they are unlikely to ever succeed. I do not know why more parents fail to appreciate this basic concept. So even though it is hard, in many situations where I could easily “save the day”, I hold back and leave it to my kids to either succeed or fail. If they succeed, they did it on their own and are building the confidence to fly without a net. If they fail, I hope they learn the lesson that experience has to teach them and are better able to handle bigger failures in the real world. So when my 12 year old asked me for $5 to test his rifle skills at the fair, I saw it as one of these teaching moments. My 12 year old is a good shot. He has handled and shot rifles, shotguns and pistols. He has logged hours of classroom study and range time at several Boy Scout Camps he has attended. Many of my friends who are enthusiastic about shooting have taken him to the range and been quite impressed with his abilities. He is literally an award winning marksman. So when he saw the “rifle” game at the fair, it was a chance to impress his relatives and win a big prize. All he had to do was hit 2 out of 3 cups from a rifle that shot a cork from ten feet. I know the deal. Any “game” at a carnival is rigged in favor of the house no matter what. The easier the game looks, the less likely you are to win. I learned this after many unsuccessful attempts to impress the ladies in my youth. But my 12 year old obviously did not know this to be true. I gave him the $5 and he confidently approached the booth and waited his turn. His first shot, missed. The 12 year old was horrified and asked the carnie if he could use a different gun. He took a second shot and missed again. The 12 year old looked at me in disbelief as the target was large and only 10 feet away. He asked to use a third rifle. The Carnie could tell my son was on to him, and suggested that he “aim higher”. At this point I saw the light bulb go off and the 12 year old gave the carnie the funniest evil eye I have ever seen acknowledging he had been had. The 12 year old aimed very high and was able to hit the third shot and win a very small prize. For $5, my son finally learned the lesson I had been trying to teach him for years. Carnival games are rigged and life is not fair. The practice of family law is very similar to this. If you are paying attention, you will see the things that work, and the things that don’t. Sometimes things are not very fair and there is absolutely nothing you can do about it. You will fail, and if you cannot handle that failure you will probably not have a high quality of life if you continue in this practice. However, if you can handle defeat, even when it is not fair, you will thrive in this stressful line of work we have chosen and hopefully sleep well at night. The 12 year old has it easy. I sure wish when we experience failures and learn a “lesson” in our practices, it only cost $5.